I have been using a Hobie i11s inflatable about two years and generally was very happy with it. 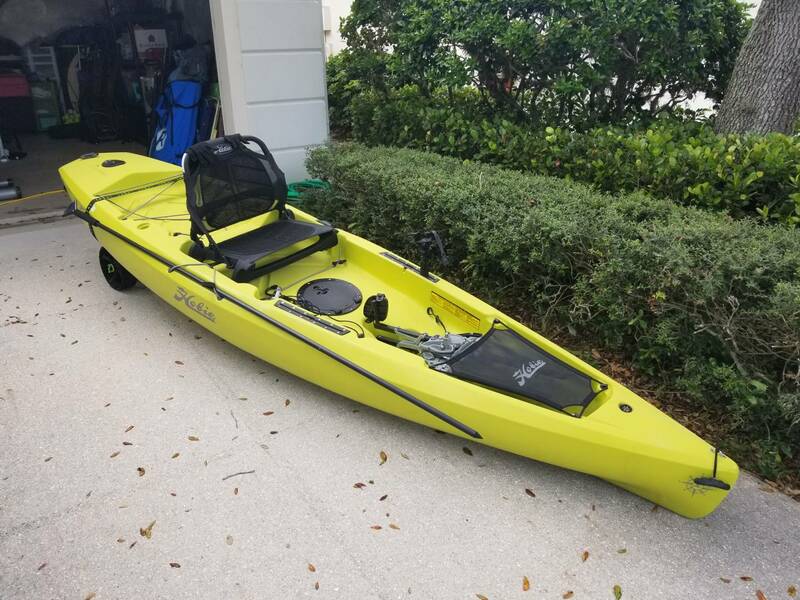 However, after a variety of warranty issues cropped up, Hobie concluded that the seams in an inflatable do not hold up well in the heat of south Florida, and resolved the issue by making me a very generous deal on a hard kayak. They offered a Sport, Revolution or their new model, Compass. I chose the inflatable in the first place because the Sport was too small for me, the Revolution not stable enough to stand in, and the Outback too heavy for me to cartop (with rotator cuff issue that I as dealing with at the time). Had the Compass existed at the time, it would probably have met all of my needs. It is 3' longer than the Sport but weighs only about 1 lb more, and it is 12' long, so it is between the Revo 11 and 13 models. Hobie designed it by combining the bow of the Revo with a scaled down stern of a Pro Angler, creating a kayak that is fast and maneuverable, but stable enough to stand in. Hobie gave it a rudder similar to the PA, so it will flip up under the boat, but still act as a keel to aid in tracking while paddling or poling. With the rudder and drive fins up, it draws only a few inches, and can be poled through as little as 5" of water (with a 170-lb person in it). The mesh seat is comfortable and has a decent lumbar support. The deck is wide enough and flat enough to stand and stable enough to cast a fly rod. Hobie only exchanged the hull and seat, and I kept the Mirage drive that came with the i11s, but the local kayak shop upgraded the standard drive to the 180, so I now have reverse drive, too. I have only had it out twice, but so far, I am very impressed and very happy. It is faster and handles boat wake better than the i11s, and is more stable to stand in than my iSUP. Before the problems arose with the i11s, I had been considering getting a Dragonfly SUP for use in places where I did not feel comfortable with an inflatable. I have experimented with leaving the seat and drive out of the Compass and paddling it as a SUP, and it is impressively stable, fast and maneuverable that way, but the speed and efficiency of the Mirage Drive are such that I see no reason not to use them. I have to give major props to Nautical Ventures in North Palm Beach. They went to bat for me with Hobie on the warranty issues and the exchange, and then did the drive upgrade for me at a discount. The customer service from both Hobie and Nautical Ventures has been outstanding. As for the Compass, I would highly recommend it. Last edited by mjkirshner; 08-24-2018 at 06:01 PM. Good to hear that both the local dealer and Hobie provided excellent customer service! That sure looks like a sweet setup. I am basically a minimalist, and I like the way Hobie kept the boat as light as possible, but included features like the built in gear tracks. I added only an anchor trolley (on the side not visible in the photo). I may switch out the round hatch for a square one, which has a reinforced frame that makes the deck a little more rigid for standing. If I buy the hatch, the shop here will install it at no charge and also move the round hatch to the front, under that skirt, so you end up with two hatches for the price of one, and a more stable deck for sight fishing. Compass 360 jackets--anyone tried one? Hobie Pro Angler 12 ? ?